The international symposium on “15 years of progress in radar altimetry”, organized by CNES and Esa, reviewed the key advances made possible by altimetry satellites. More than 500 scientists from 60 countries presented their results and turned their attention to future altimetry missions. An altimeter is a radar instrument that measures sea-surface height with very high accuracy. It works simply by beaming down a signal that hits the ocean surface and then bounces back to an antenna. The distance (or range) from the ocean to the satellite is then calculated from the return-trip time of the signal. Combined with ultra-precise positioning information, derived chiefly from the French Doris system, this range measurement is converted into sea-surface height. In the 1970s, several satellites were launched to validate this radar altimetry concept, paving the way for future missions. In later years, with the launch of the European ERS-1 satellite in 1991 and especially the French-U.S. Topex/Poseidon satellite in 1992, satellite altimetry data completely transformed our understanding of the oceans and the currents driving them. At the outset, these sensors were developed for climate research but their data soon extended the spectrum of scientific and operational applications. The study of polar ice caps, monitoring of water levels in major rivers, tracking of marine animals and ship routing are today all routine applications of satellite altimetry. In the early days of radar altimetry, there was speculation about its usefulness within the wider oceanographic community. Indeed, it took over a decade for its full impact to be realised. Today, satellites are capable of measuring variations in sea-surface height with an accuracy of 2 cm. Radar altimetry has enabled oceanographic research to make great strides. 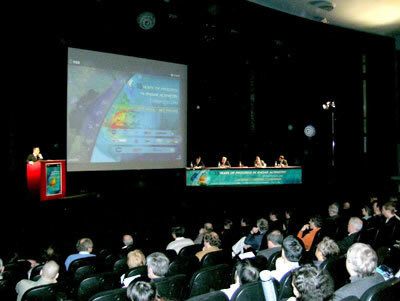 But according to some scientists at the symposium in Venice, Italy, its biggest contribution is to have changed the way scientists view the oceans. Scientists are now feeding altimetry measurements with in-situ data into ocean forecasting models like Mercator in France to predict the state of the ocean surface and subsurface. Using these vital observations, oceanographers are highlighting very slow variation phenomena and what is increasingly clear is the way they interact with the atmosphere. In the field of climate research, gaining a closer understanding of ocean/atmosphere interactions is a key challenge that lies ahead for scientists who, with other users, are demonstrating the huge benefits afforded by altimetry simply through its ability to measure distances from space. CNES Programmes: Topex/Poseidon, Jason, Doris.